I saw NINA FOREVER back during last year's Fantasia. I went into the film not knowing what it was, simply that was playing at the Festival. I love Fantasia so much that I will simply watch anything they are showing. So it was that I plopped down and just watched NINA pretty much blind. I came out of it a huge fan. I was so much a fan that it ended up on my year end list of film finds. It's being released and now you all can see what is one of the best horror comedies in a very very long time. Go see it- you'll love it. Here's my Fantasia review. 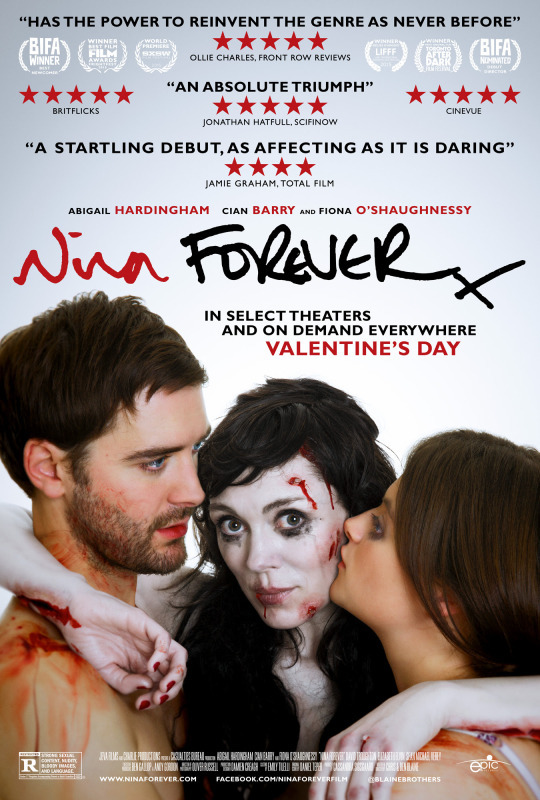 Solid horror/romance/comedy that is definitely worth a look see. The plot of the film has Holly falling madly in love with Rob, a co-worker. Rob recently lost his girlfriend Nina in a horrible accident and has tried to kill himself as a result. Holly likes his intensity. Through perseverance the pair hook up- unfortunately the first time they make love the dead Nina materializes in their bed bringing a bloody mess with her. Can the lovers work out how to handle an undead lover's return? This is a great film. An expert mixing of genres this should neither be as funny as it is, the humor is very black, nor should it be as moving as it is, because say what you will we have real people on the screen. The humor arises naturally out of the situations and isn't forced. The fact that the Blaine brothers who wrote and directed the film manage to keep it real even as things get fantastic is a major achievement. Its actually a rare thing and it manages to kick the film from being really good into something incredibly special. What helps to make the film so strong is that beyond the story the film is examining the nature of love, our connections to other people, how we grieve and even simply relationships. Throwing a dead lover in the mix we are forced to really ponder what we mean when we say forever. I suspect that if you went to see this with your significant other this film will kick off several long conversations.